RISE is a fast-readout camera developed in collaboration with the Queens University Belfast for the precision measurement of transiting exoplanet timing. The camera optics were designed by John Meaburn. Mechanical design work was done at Liverpool JMU, and mechanical and software build done at QUB. The CCD camera in use with RISE is an Andor DW485 which houses an E2V CCD 47-20 frame transfer device. 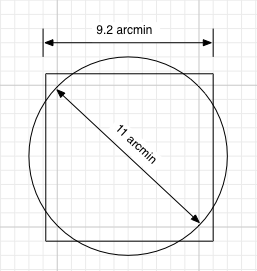 Sketch of the RISE unvignetted field-of-view (the circle) superimposed onto the square CCD field. RISE now uses a single fixed 720nm longpass filter, which can be thought of as approximately "I+Z". It was installed on 26th July 2017. Prior to that date, RISE used a "V+R" filter made from combined 3mm OG515 + 2mm KG3 filters. The instrument has a reduced sensitivity due to the lower quantum efficiency of the chip at this wavelength range. We estimate the effect to be a decrease of approximately 1 magnitude in zeropoint. Whether the filter change will have a positive or negative impact on signal-to-noise will depend on the SED of the target. The filter change was performed in order to optimise RISE for studies of very red, cool stars. Some fringing is apparent in our test data. The amplitude of the fringes is approximately 2 to 4 per cent peak-to-trough in normal dark sky. Our initial analyses show that it is fairly straightforward to subtract the fringes from the data (see below). A test RISE frame using the "I+Z" filter, before and after a basic fringe correction. 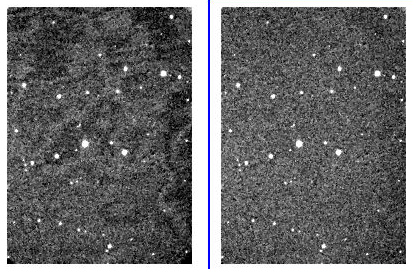 The sensitivity of RISE is similar to that of IO:O (and RATCam before it) with an SDSS r'-band filter. Even so, those preparing proposals should use our Exposure Time Calculator as a guide to the signal-to-noise ratio expected with a given exposure time, seeing, sky brightness, etc. RISE is, however, typically used with very short exposure times on bright targets, often with the telescope defocused to avoid saturation and to minimise uncertainties associated with flat-fielding. We STRONGLY RECOMMEND that users planning long groups (more than 10-20 minutes) submit a test observation to establish the best exposure time and telescope focus setting for their needs. Note that saturation occurs at around 40,000 counts with 2x2 binning. 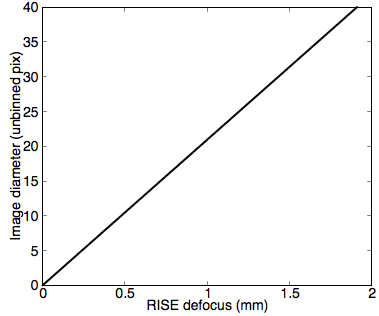 The following plots illustrate the PSF diameter and peak count rate you can expect as a function of defocus. The diameters are derived directly from the optical prescription of the telescope and instrument optics. The relative peak height is derived empirically from data similar to the table above and must only be treated as a rough guide since the result is so dependent on seeing conditions. 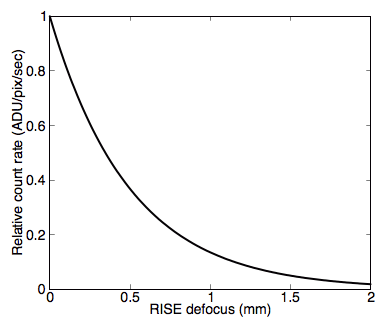 Above: General guide to effect you may expect as a function of RISE defocus. True integration on sky is about 18msec longer than the requested integration. The entire frame receives the same illumination, so relative photomtery between two sources in an image is unaffected by the 18msec excess integration. The original science case for which RISE was designed demanded sub-second timing precision when determining the centroid of occultation events that lasted several hours. This is easily achieved with RISE. However the fact the camera can be read at faster than 1Hz makes it appealing for a variety of other high precision timing experiments. We here summarise the main factors that limit accuracy of the data time stamps. Please contact us if you wish to discuss the implication of these effects on your science or anything that can be done to enhance accuracy on specific observations. The time signal is based on NTP which is not a high precision timing protocol. The clock is however synchronised directly to a local, stratum 1, GPS receiver and over several years of operation has demonstrated <70msec accuracy. An estimate of the expected NTP error is written to each FITS header (keyword NTPERROR) and has a median value of 20msec. The value is typically a constant through the duration of a single observation sequence. In addition to the systematic offset from the NTP synchonisation, every individual FITS file will exhibit jitter from two separate sources in the CCD read procedure, one of 50msec and the other of 20msec. Combining these gives a timing jitter on an individual frame of 54msec. Averaged over a reasonable number of frames, this frame-to-frame jitter is expected to contribute no systematic timing error. The jitter is on the time stamp written, not on the true timing of the observation. I.e., it is in principle possible to resample the FITS header time stamps to evenly interpolate over an observation sequence to recover a more accurate time for any single frame. The true jitter on the observation epoch cadence has never been directly measured, but is believed to be orders of magnitude smaller than the time stamp errors quoted here. In summary, combining all the above, the time stamp on a single FITS file should not in isolation be considered to be better then 90msec. For the benefit of observers performing long term monitoring we here summarize the dates of major hardware changes that could potentially leads to changes in photometric calibrations. Filter change (2017-07-26): The single, fixed filter in RISE was changed from visble band to near infra-red on 26th July 2017. See 'RISE Filter' for more details. 2018-06-27: Tertiary feed mirror cleaning gives significant step-change increase in total throughput. In general we recommend 2x2 binning is used for all RISE observing due to the better linearity and cycle time in this mode. For bright targets you must be very careful of saturation and may well need to defocus the telescope. Users are also encouraged to use MULTRUN exposures with RISE.